BelSentiero is a beautiful renovated old stone farm house in the Val d'Orcia World Heritage area near Pienza, Tuscany, half way between Rome and Florence. We are in the heart of the most beautiful part of Tuscany where scenes from Gladiator and the English Patient were filmed. An area of rolling hills that are green in Spring and turn a golden brown in summer as the wheat ripens. An area dominated by the extinct volcanic cone of Monte Amiata and encompassing the famous wine regions of the Brunello and Montepulciano. Dotted throughout with historic towns and villages as if from the middle ages. Set on ten hectares amongst the oak and chestnut forests we have magnificent views over the Val d'Orcia valley all of which can be enjoyed from our large 120 square metre verandah: perfect for the summer barbecue. 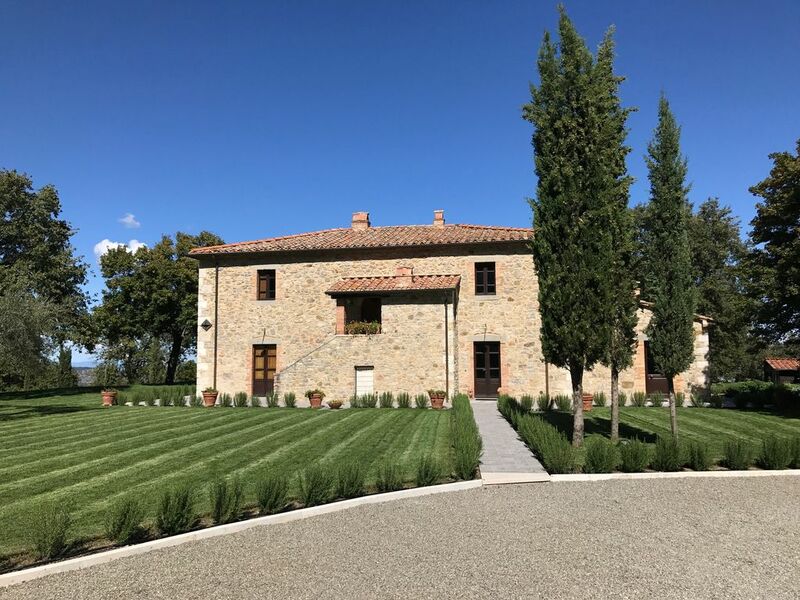 The property itself contains all the traditional features you would expect in Tuscany such as stone walls, terracotta roofs and floors with oak beams and wooden shutters, but without compromising on luxury. There is air-conditioning throughout, free wifi, large screen TVs and super luxurious extra length king size beds with Egyptian cotton sheets in all the rooms. This is in addition to the writing desks with mini-bars and mood lighting in all the bedrooms. Outside the house is surrounded by a beautiful garden. Green lawns, cypress trees, geraniums in terracotta vases, and rosemary and lavendar surround the house. This is the quintessential Tuscany of the movies and paintings. Sometimes in the mornings you will even see the wild deer in our meadow or grazing at the dam. Please note that we are a Bed & Breakfast and we have 4 rooms, all of which are fairly similar in size and style (each room is 24 square metres). Two of the rooms can only accommodate 2 guests each, while the other rooms can accommodate 3 guests each (contains a king size bed and a single bed). So in total we can accommodate 10 guests. The price quoted is the price per room including breakfast. Located in one of the most beautiful and amazing places on this earth ... ... with owners who live on the property and are passionate about ensuring you get the most from your holiday.